1. From a Description of Reb Elchonon Wasserman's Final Moments by Rabbi Ephraim Oshry, an Eye-Witness [appears in Yiddish and Hebrew in the Introduction to Kovets Shiurim]. "In the heavens we are apparently regarded as righteous people, for we have been chosen to atone, through our physical selves, for the Jewish nation. Therefore, we must engage in complete repentance, and immediately … time is short. The way to the Ninth Fort (where the martyrs of Slobodka-Kovno were slaughtered) is near, and we must keep in mind that through our repentance, our sacrifice will be held in greater favor. No improper thought should enter our mind, heaven forefend, for it would be like a blemish, invalidating our sacrifice. We are now fulfilling the greatest mitzva. "You set fire to it, and through fire You are destined to rebuild it" (from the Tisha Be-Av prayers). The fire that burns our bodies will be the fire that will return and revive the house of Israel." (Rabbi Ephraim Oshry, Responsa Mi-Ma'amakim, part II, siman 177). (ה) ומהו זה שאמר דוד טוב וישר ה' על כן יורה חטאים בדרך ידרך ענוים וגו' זה ששלח נביאים להם מודיעים דרכי ה' ומחזירין אותן בתשובה ועוד שנתן בהם כח ללמוד ולהבין שמדה זו בכל אדם שכל זמן שהוא נמשך בדרכי החכמה והצדק מתאוה להן ורודף אותם והוא מה שאמרו רז"ל בא לטהר מסייעין אותו כלומר ימצא עצמו נעזר על הדבר והלא כתוב בתורה ועבדום וענו אותם הרי גזר על המצריים לעשות רע וכתיב וקם העם הזה וזנה אחרי אלהי נכר הארץ הרי גזר על ישראל לעבוד כו"ם ולמה נפרע מהן לפי שלא גזר על איש פלוני הידוע שיהיה הוא הזונה אלא כל אחד ואחד מאותן הזונים לעבוד כו"ם אילו לא רצה לעבוד לא היה עובד ולא הודיעו הבורא אלא מנהגו של עולם הא למה זה דומה לאומר העם הזה יהיה בהן צדיקים ורשעים לא מפני זה יאמר הרשע כבר נגזר עליו שיהיה רשע מפני שהודיע למשה שיהיו רשעים בישראל כענין שנאמר כי לא יחדל אביון מקרב הארץ וכן המצריים כל אחד ואחד מאותן המצירים והמריעים לישראל אילו לא רצה להרע להם הרשות בידו שלא גזר על איש ידוע אלא הודיעו שסוף זרעו עתיד להשתעבד בארץ לא להם וכבר אמרנו שאין כח באדם לידע היאך ידע הקב"ה דברים העתידין להיות. The Westhampton Eruv Video. Quite funny! Is it possible to start a new yeshiva without a rich backer(s)? In forgetting this smallness we would suddenly remember greatness. In destroying this despair we would suddenly renew souls. Evil would dissipate. Stupidity would dissipate. Surely a bridge would be built between man and his brother, a ladder would rise between Earth and Heaven. It is told about the Gr”a zt”l that anyone who overheard him at the time of Kabbolas Shabbos saying: “Today, if you listen to His voice,” would immediately become a Ba’al Teshuva. Today! This moment! Immediately - and eternally. Beautiful sentiments. But are they applicable to the “real” world? There are definite populations that would love such a yeshiva for their children: The more “yeshivish” YU alumnus who wants his son to enjoy intensive Gemara; the “Charedi” yeshiva alumnus desperately seeking “braitkeit,” the “Ba'al Teshuvah” seeking a holistic, positive educational environment. 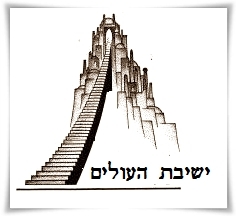 There you will find its tentative name and logo (and their background in the educational program of Dr. Nathan Birnbaum zt”l), and a tentative mission statement as well (with significant basis emerging from the writings of R' Avrohom Elya zt”l). Forgive me if this is intrusive, but I had heard the name XYZ from _______ in connection with the evidently stillborn new... high school, which – from my conversations with Rabbi ABC and Dr. DEF – certainly sounded like it was along the same lines as the [new yeshiva described above], and which sounded wonderful. If this is you, may I ask what happened? If not, please forgive my inquiry. Yes, that was me. What happened is we were not going to do go ahead with it unless we had the money to do it right, and we couldn't get the amount of money needed. To do it without being well funded up front will inevitably result in compromises that will render the school not fundamentally better than all the other b'di'eveds that are already out there, and lots of time and resources of Klal Yisroel will have been wasted to just create another b'di'eved. I don't want to sound frum, but if we perceive this to be Ratzon Hashem, shouldn't we proceed with some measure of Bitachon? Moreover, if the ideals of the parents and of the faculty are in sync, why should the school not work, even if its resources might be somewhat limited? 1) See Chazon Ish Emunah U'Bitachon perek 2: Bitachon doesn't mean that we assume things work out as we want them to. 2a) In any economy, kal vachomer the current economy, a small group of interested parents don't have the resources to pay for a new school without serious backing of a very big gvir. 2b) One would have to be a fool to send his child to a brand new school that lacks serious gvir backing and has no track record. Perhaps this exchange is but a furtherance of my education, and a further chipping away at my childish naivete, but I always believed what R' Avrohom Elya wrote. Was I wrong? Evidently. Although the thought depresses me, it is also oddly comforting. I tend to think of myself as a coward – that it was my fault that a dream that I had for many years, of opening my own yeshiva, never came to fruition. That if I had the “right stuff” I would cry out Me laHashem Elai! and do what I thought right regardless of lack of finances. But, if I was wrong, and without a gvir – preferably gvirim – one cannot found a yeshiva, then I have been justified in not pursuing dreams I once had – it was just fate, since none of my friends have become gvirim (yet)! Of course, I still hope this is not true. Because if it is, it means that the geulah is really in the hands of the gvirim. Not the rabbonim, not the nashim tzidkaniyos, and certainly not you and me. The “moment” for which R' Avrohom Elya yearns is very expensive, and can only be produced with the cooperation of the wealthiest individuals. I would have loved to have the concept of Yeshivas HaOlim around for my kids. I would love to have it around for the kids I still have in the system. I think it would be an extraordinary to'eles for vast number of boys. I am sure many readers would agree with me. Can we prove XYZ wrong? So, the nes occurred on the day of Shevisas Ha'Man (see the previous post). And Haman was hung that evening, the eve of the second day of Sefirah. Shteit in Seforim (see Ohr Gedalyahu on Lag Ba'Omer) that the 49 days of Sefirah correspond to the 48 ways in the sixth chapter of Avos, with one day to bring everything together. The second day's middah is shemi'as ozen. The ear is called ozen because it provides balance. Which, as Rashi says in Parashas Beshalach, is the purpose of the Torah - איזון מצוות. Mordechai is ben Shim'i - he heard, and therefore his tefillos were heard (Megillah 12b), but he was also ma'azin. Shemi'ah is chochmoh - acquiring the knowledge (ישמעו אזניך מה שפיך מדבר) - and Ha'azanah is binah - understanding what it has to say. Binah is חכמת נשים - and חכמת נשים בנתה ביתה. What House? the House of Malchus - לבוא מבית הנשים אל בית המלך. That coming has to be out of שחוק וזמר (see Rashi to that pasuk), which grinds (shochek) and prunes (zomer) the bad, to make it good when possible, and eliminate it when necessary. This is the highest bechinah of Hashem's relationship to the Beri'ah - which only will be accomplished fully b'Acharis HaYamim - שוכן שחקים - when then ותשחק ליום אחרון. For ultimately, when you really listen, you will know and proclaim כל מה דעביד רחמנא לטב עביד and, as the Chazon Ish said that there is no sadness for one who perceives אור האורות of the ultimate truth. ותלבש אסתר מלכות - that is the עז והדר לבושה. Oz is inner strength, hadar is outer splendor. The simchah of the da-herr brings inner strength and outer splendor (malchus and kehunah ויש להאריך!). So, of course, Mordechai is mentioned 58 times in the Megillah - k'minyan אזן. In the end, however, the chiddush of Purim is even ad d'lo ya'da - take away the da from the da-herr. A drunk really has difficulty hearing others. But the "inner ear" is always attuned to דעת עליון. Toras Purim 5771 p. 4: New ta'am for Hamantaschen, Haman or HaMan? יִדַּע רֶמֶז הַקּוֹרוֹת לְעַם מְעֻפָּר וּמְהֻדָּס. כְּתָב הַסְתֵּר אַסְתִּיר וּמָר דְּרוֹר מְפֻרְדָּס. לִשְׁבּוֹת הָמָן מִמָּחֳרָת הֲמִן הָעֵץ קֻנְדָּס. Elah, shelefi devareinu, it is astonishing that all the Siddurim - even those (see below - the AS translation does not note the allusion, ayain sham) that recognize the connection, have הָמָן not הַמָן (The Man instead of Haman)!